Combine celery root, onion, garlic and chicken broth/stock in a medium saucepan. Bring to a boil, cover and reduce heat to medium-low. Simmer for 20 minutes or until celery root is very tender. Meanwhile, cook the potato in a separate saucepan in salted water until tender. When celery root is fully cooked, drain off excess chicken broth/stock (reserve for another use if desired), leaving about 1/4 cup broth/stock in the saucepan with vegetables. Add the butter and cream. Puree with an immersion blender until smooth. Drain the potato. 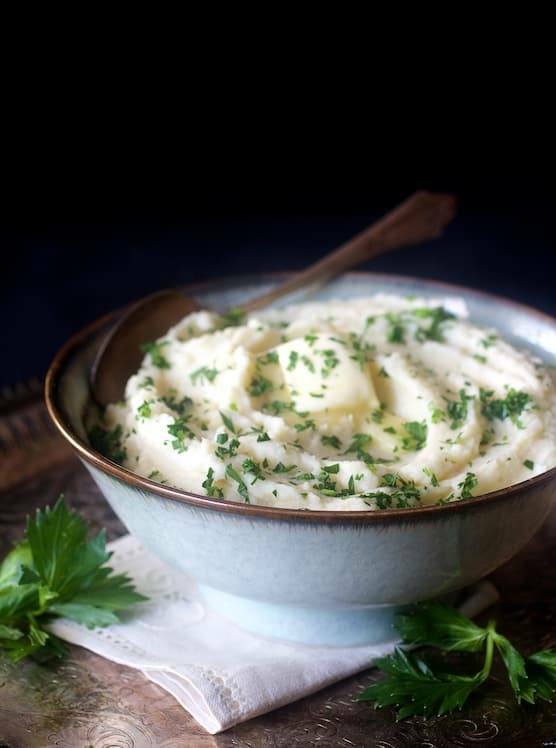 Push through a potato ricer into the puree and gently fold it into the puree. Season to taste with salt and black pepper. Garnish with chopped fresh celery leaves or parsley and extra butter if desired.